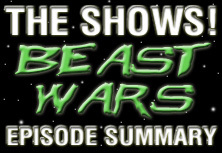 Beast Wars Second takes place after the Beast Wars cartoon, but before Beast Machines (Beast Wars Return). It also takes place before both Beast Wars: The Gathering and Beast Wars: The Ascendingcomic series. It does not take place in this era, nor does it take place in the past as the original Beast Wars does. It takes place solely in the future that the Beast Wars cast came from. During the time of the Pax Cybertronia, a treaty that kept the Predacons in check, Lio Convoy amassed a secret squad to stand guard in case of Predacon activity. Galvatron and Megastorm, two brothers, also pieced together a group of Predacons in search of energy sources. The planet Gaia was full of energy and would be the host of these "second" Beast Wars. Convoy and Apache investigate something in space, but Convoy is lost. The Predacons (Destrons) arrive on planet Gaia to find a huge power source. Artemis and Moon contact the Maximals (Cybertrons) to check on the Predacons. The Maximals are attacked en-route and crash land. There, they take up beast forms and head towards the Predacons, led by Galvatron and his brother Megastorm. The Maximals follow the mysterious white lion and discover their crashed spacecraft. They also find out the white lion's true identity. Meanwhile, Galvatron finds a huge computer and uses it to scan for the most powerful object on the planet. When he takes that as his new mode, he is left immobile. This leaves Megastorm as the new leader. He orders the Autorollers and the Predacons to take new forms. He orders the Predacons to bring him the white lion, but will he like what he gets. We also learn what happened to Convoy. Big Horn learns that he has more rage due to his beast mode, especially when he sees red. This is despite him being a buffalo and not a bull. As the Maximals search for the Predacon base, the Predacons are searhing for Lio Convoy. Big Horn's rage seems to be a detriment to the team, especially with Kid poking fun at him, but he learns he can use it against his foes. He also reveals that a secret missile launcher is exposed when someone pulls his tail. Tasmanian Kid discovers the secret location of the new Predacon base. He disobeys orders so that he can surprise the other Maximals. He is quickly captured by Starscream and used as a decoy to draw the Maximals into a trap. Can Diver and Scuba rescue him before the other Maximals are captured?